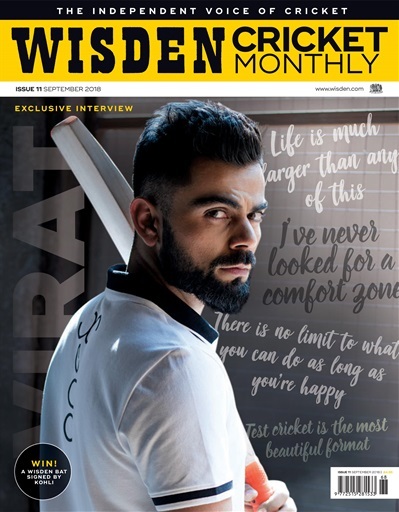 VIRAT KOHLI - EXCLUSIVE INTERVIEW! In a rare one-to-one interview, Virat Kohli sits down with Jo Harman to discuss his first 10 years as an international cricketer, what life outside of the game looks like for a 21st-century deity and the future of “the most beautiful format”. Felix White speaks to a batch of former England spinners about their first experience of international cricket and their unique place in the fabric of the English game. Elsewhere, there are columns from Jonathan Liew and Kumar Sangakkara, and Rich Evans argues self-interest and selection politics are creating divisions in our cricket clubs. In another jam-packed issue, Mike Brearley considers whether Kohli qualifies as a sporting genius, Elizabeth Ammon reports on the green shoots of recovery at Durham, Katherine Brunt tells us cricket was her escape from being bullied, Alec Stewart channels Sir Alex Ferguson in bringing the good times back to Surrey, John Stern visits New Road to learn the secrets of Worcestershire’s production line of young talent and Phil Tufnell reveals a near-death experience.